Banbury United had to be content with a point in Saturday’s Evo-Stik League South stalemate with Tamworth. Both teams had chances to take all three premier division central points at the Banbury Plant Hire Community Stadium. United had the better of them but just lacked that cutting edge when they came. 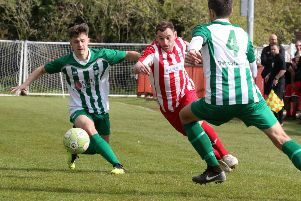 As Mike Ford hinted in midweek, Giorgio Rasulo partnered Steve Diggin up front with club captain Ricky Johnson remaining in central defence alongside Lee Henderson. Following an even opening period, United began to carve out the better chances and Jack Finch fired over from 25 yards. Diggin found the overlapping Greg Kaziboni who picked out Rasulo but the angle was too tight and Jas Singh turned his effort around his near post. From the ensuing corner, Tamworth failed to clear and Singh did well to keep out Amer Awadh’s close range effort. United went close again when Johnson headed the ball on to Rasulo but Singh quickly closed him down before pushing his effort wide. Moments later Rasulo raced on to Kaziboni’s pass and tested Singh from 15 yards. Tamworth replied with Kyle Finn shooting straight at Jack Harding and Aman Verma firing over. That signalled the start of a good spell for Tamworth and it took a last-ditch block by Charlie Hawtin to thwart Chris Lait from ten yards. United had the final chance of the first half when Rasulo curled a free-kick into the side-netting. After the restart substitute Jordan Clement advanced and forced Harding into action and Stefan Moore just failed to get on the end of Finn’s low cross at the far post. In between, Kaziboni cut inside but shot straight at Singh. It was the visitors who created the early openings, Finn cut inside and his deflected effort was saved by Harding. United’s first chance came when Henderson headed Rasulo’s far post corner over. Rasulo skipped past a couple of defenders and set up Kaziboni who fired wide of the near post from 15 yards. Finn was a constant threat on the right and his low cross caused problems with Moore having a close range effort blocked. A neat move on United’s right ended with Rasulo exchanging pass with Kaziboni and his cross scraped the bar. The game opened up in the closing stages and more good approach play from Rasulo saw him set up Nash who fired over from the edge of the box. Tyrell Waite blazed over from a good position as Tamworth came back into it but Rasulo’s low cross just failed to find Diggin after more neat approach play from Kaziboni.